At the back row you can see relay and extension devices; Nikkor 85mm f/2 Ai, 3 stage extension rings, Nikkor 200mm f/4 Ai and 150 mm bellows. All shot using Nikon D7100 and Godox ML-150 macro ring flash in the dark with 2 sec exposure and second curtain sync, all the lenses reversed. 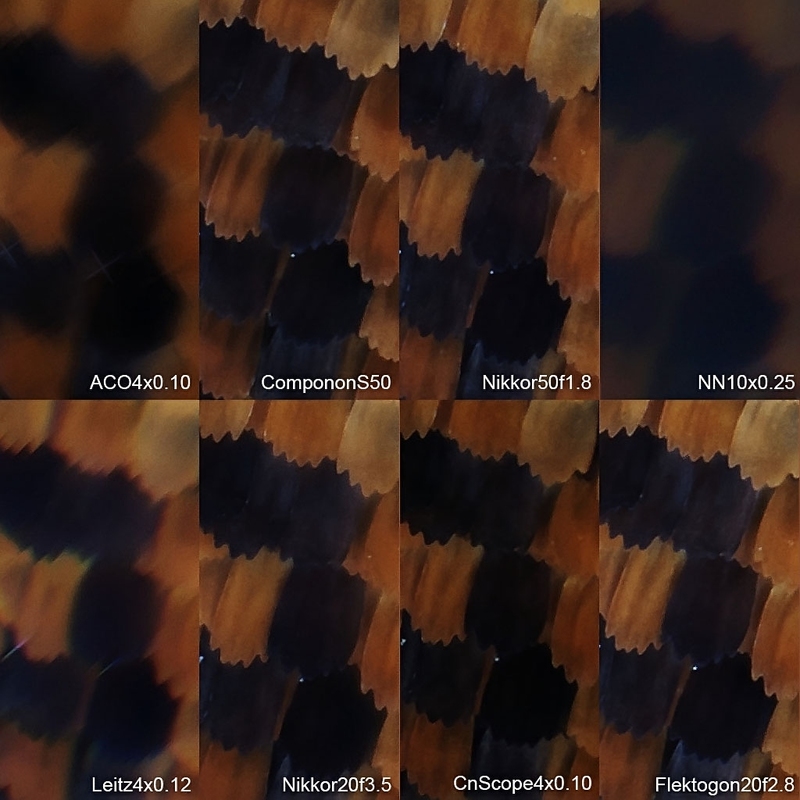 Butterfly wing shot as 11 segment stack at 40 micrometer steps. All the lenses/objective were properly shaded and extensions/adapters covered in black matte finish. Upper row using 85mm and 200mm lenses, lower with bellows/extension rings. Contrast difference is huge and disqualified extension way from the remaining tests. Important detail to point out is the optimal aperture: Componon and Nikkor 20mm did their best at f/4 while Nikkor 50mm and Zeiss peaked at f/5.6. Although I did my best to keep flash to object distance constant, slight variations resulted in different shades and detail presentation. Again, differences are not huge IF the lens/objective is designed for this kind of image circle size. Three lenses performed terribly in this test: 10x ND 0.25 mounted directly to camera mount (approx. 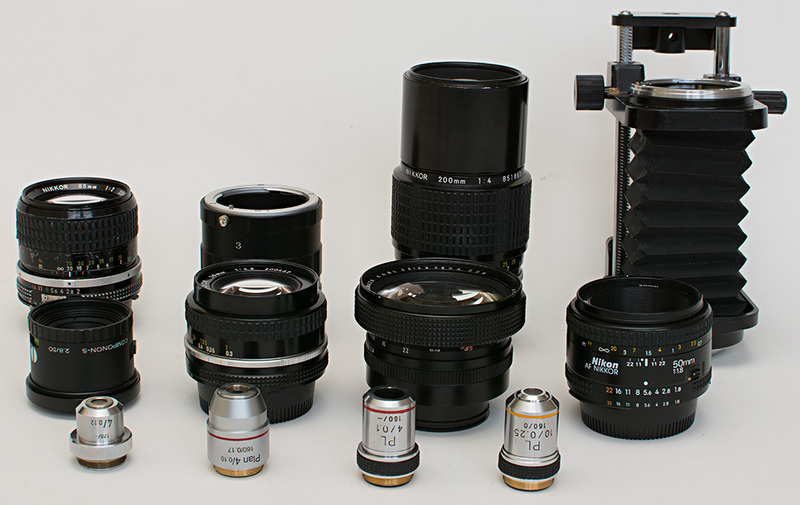 4.5x magnification), Another 4x Chinese Objective and Leitz 4x 0.12. The first one was not expected to do any good since it was pushed way out it˙s design limits while Leitz is actually not an achromat,, requiring eyepiece compensation. A very impressive and useful piece of work. I cannot recall any other direct comparison between using reversed lenses on an extension tube and stacking the same lenses on telephoto primes. The improvement which using a prime makes is striking and consistent. Feel free to edit my images. Excellent, very useful comparison, thank you. Another educative and interesting test/review. Thanks Miljenko! See HERE for one test at 2.45X, comparing a Mamiya-Sekor 55mm f/1.8 at f/5.6 under two conditions: stacked on a 135 mm prime or at matched magnification reversed on bellows. In that case the difference in central quality was minimal, but edges were notably better with the prime. I'm actually very surprised by the magnitude of the differences shown here by Miljenko. I have to wonder if the bellows configuration was suffering from some internal reflections that added veiling glare, versus the presumably effective baffling inside the primes. As I pointed out, special care was taken in shading lenses front ends as well as darkening/antireflex treatment on bellows, extension rings and RMS adapters. Three lenses tested on both relay lens and extension are very different to each other, relay lenses were different and extension was different (bellows vs hard extension rings). Exposure was adjusted to get the contrast curves aligned at medium brightness values. So, conditions were very well controlled and taken care of. After testing the first lens for differences, I decided to include another two in order to avoid any systematic error. Therefore, I can claim with authority that reversed full frame lenses achieve better performance (at least when it comes to contrast and saturation) using long prime relay lenses than using them with bellows/rings extension. I am a little surprised too by the difference. I am an advocate of reversing onto primes but at 4x isn't that far away from what the componon-s 50/2.8 is designed to do. I guess it still isn't high enough. I would expect huge improvements under 3x but only if the relay lens is up to it. I have found that some primes will do well but so far all I have tried vignette to some extent with a full frame camera (sony a900). For me, Enlarger lenses do better. Judging by the dark corners I suspect vignetting. Could be the relay lens or too much distance between lenses. Won't be the Componon. There is another interesting point. Your camera is a 24MP APS-c. Such high resolution is very much the way things are going but it does bring the advent of diffraction limits and empty magnification to lower effective apertures. The Sony NEX-7 uses the same sensor so you can get a taste of the problem here . What it shows is close on doubling of blur between f/8 and f/1 6. Given that the best of enlarger or camera lenses need to be stopped down to f/4 then even with a tube lens that is going to be f/8 effective at 2x. Much higher will result in empty magnification. I am a little surprised too by the difference. I am not. Reversed camera lens at this kind of magnification act very much like infinity microscope objectives. If you analyse the angles of light entering and exiting infinity objective, you'll find it works the same way as the normal lens but in reverse direction. And we all know how the infinity objective works when bellows mounted. I would expect huge improvements under 3x but only if the relay lens is up to it. Nikkor 200mm f4.0 definitely is. It was selected among dozen of relay lenses tried. Visible vignetting on APS-C sensor starts at f/8, well above test aperture. 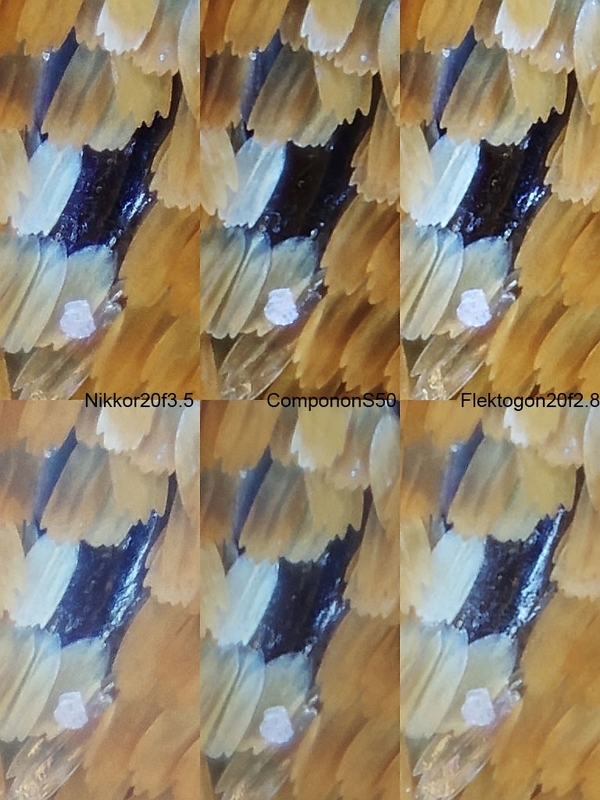 As I said above, the relay lenses in this test (Nikkors 85mm f2.0 and 200mm f4.0) were selected for perfect contrast, resolution and lack of vignetting. Distance between lenses thanks to custom made adapter rings was between zero and 2 mm. The front part of the AF200/F4 lens is about 15mm inside the top if the lens is set at max wide focus. Does this mean that you partially insert the componon lens in the 200mm lens? I have a componont 50mm F4 lens here I would also like to test and I would make an adapter yourself. Given the smaller size of this componon lens, that lens can be placed partially inside in front of the 200mm with an appropriate adapter.. But the Componon was not designed to focus at infinity and 1/4x (non reversed) is well within its specs. However I have to admit that when I checked The MFT charts for it they did look as if it would peak in the central area at infinity at a MUCH better sharpness. Yes but that is besides the point as it is a prime. To get down to a more optimal 2x you would need a 100mm lens. I was trying to make the point that at a lower magnification and faster effective aperture the relay lens has a harder job. At, say, 2x and f/8 with the optical path NOT as the designer intended in the relay lens there is very real opportunity for added blur. Also it increases the field of view which results in more light divergence before it even gets to the relay lens. Very good website. So are you getting vignetting? If you are simple logic says it won't be the direct fault of a camera or enlarger lens. You are using only 1/4 of their intended field of view. The fault must be somewhere. What I suspect is that the light is already significant diverging before it leaves the lens and the problem varies depending on the lens used. That gives the relay lens a far harder time. Ah. I stand corrected. So the camera resolves even more and one can expect the "empty magnification" problem to occur at an even lower aperture. Given the smaller size of this componon lens, that lens can be placed partially inside in front of the 200mm with an appropriate adapter.. Right now I'm using 43/52 mm step-up adapter along with "zero length" 52/52 mm male/male reversal adapter. So the front edges of both lenses are placed at very short distance. If very special custom ("U" shaped cross section) adapter would be made, one could actually insert complete serrated Componon front end into Nikkor front end. It would bring both lenses exactly 10 mm closer than they are now. I might improvise this setup and see if there is any gain in vignetting and/or any other performance aspect. Considering I still have to make the adapter I can install it as close as possible. You just need to be sure that you leave the lens in manual mode Since otherwise the front portion would come forward and press against the lens componon. I can still insert a soft rubber ring 1mm thick as protection. The next days I make an adapter on my lathe. Once the adapter is ready, I'll post a picture. There is one more thing you can consider to avoid vignetting when using a camera or enlarger lens as an objective and magnification is low. You could try using both lenses wide open and put a stop between them. Just a circle of black paper with a hole in it. Effective aperture =diameter of hole/focal length of relay lens. 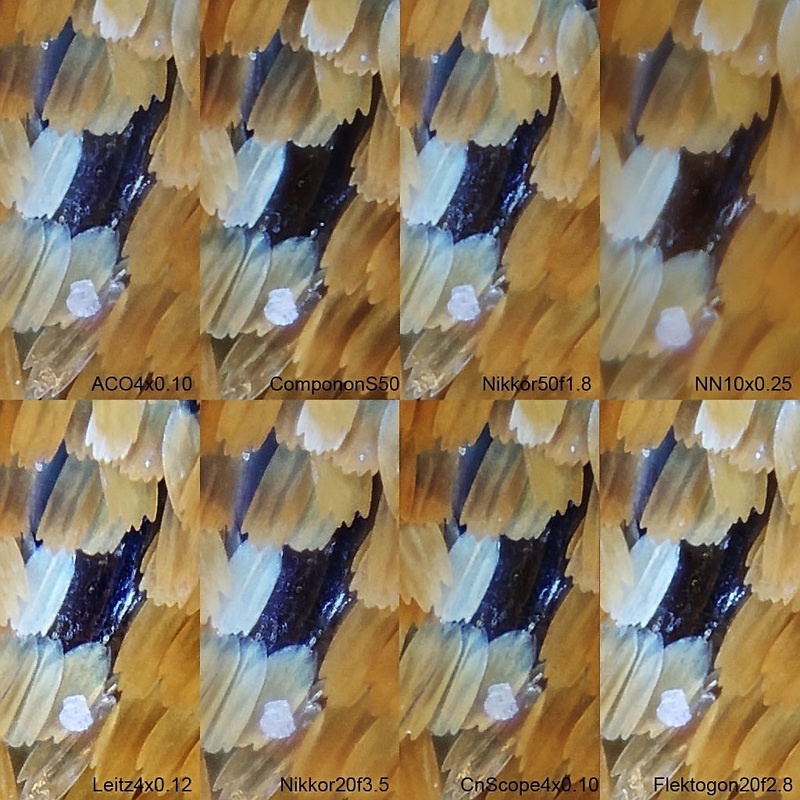 It should have the effect of making life easier for the relay lens and harder for the objective lens but there is a fair chance of a net gain in image quality. Thanks for this link! Can't speak for the accuracy of the testing but I sure like the same measurement for the many different lens! I'm not very experienced but I've been disappointed with the sharpness of the 50mm/f2.8 el-Nikkor I've been using for 1:1 to ~ 2.5x (yes, it is often stated on this site that there appears to be some considerable variation in quality of these lens. So perhaps I just have a poor one (how would I know without having several?)). But the Componon-S measurements do look considerably better. And for those prices, it's easy to try!